More documents in LPC Microcontrollers Where is this place located? 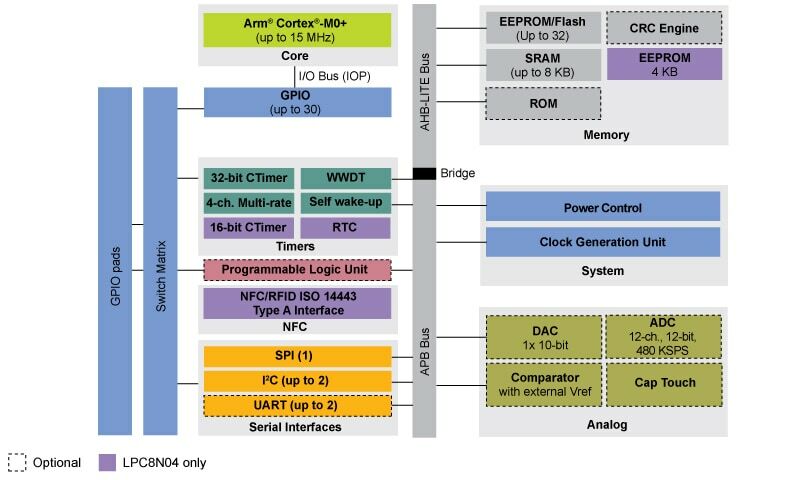 The LPC800 series is a 32-bit, Arm® Cortex®-M0+-based MCU portfolio offering a range of low-power, space efficient, low-pin-count options for basic microcontroller applications. Unique among low-end devices, the LPC800 series MCUs include differentiated product features, such as an NFC communication interface, programmable logical unit (PLU), mutual capacitive touch, switch matrix for flexible configuration, patent-approved SCTimer/PWM, and more – including a comprehensive enablement offering to help you get to market faster. (5/31) Part I: Thinking about migrating from 8-bit? Wait no longer - LPC80x MCUs are your 32-bit answer! Learn more about the LPC80x MCU family, discover the features, target applications, tools, software and how to get started right away with your 32-bit design. Continuing its history of innovation in MCUs, NXP introduces a programmable logic unit (PLU) to the LPC family for the first time with the LPC804 MCU. We'll show you how easy it is set up the PLU as we will explore several real-world examples of the challenges many face, but can be overcome with this unique feature. In May 2018, NXP expanded the MCUXpresso suite of software and tools to include full support for the LPC800 MCU family. Learn about the MCUXpresso IDE, configuration tools and SDK support that is now available for the most cost-effective and compelling family of Arm-based 8-bit replacement microcontrollers available. (6/21) Part IV: Got NFC? LPC8N04 does - Learn how to leverage this unique feature in your next design? Presentations for the webinars are also available now!